Introducing Timmy O’Connell, the Party Pooper! 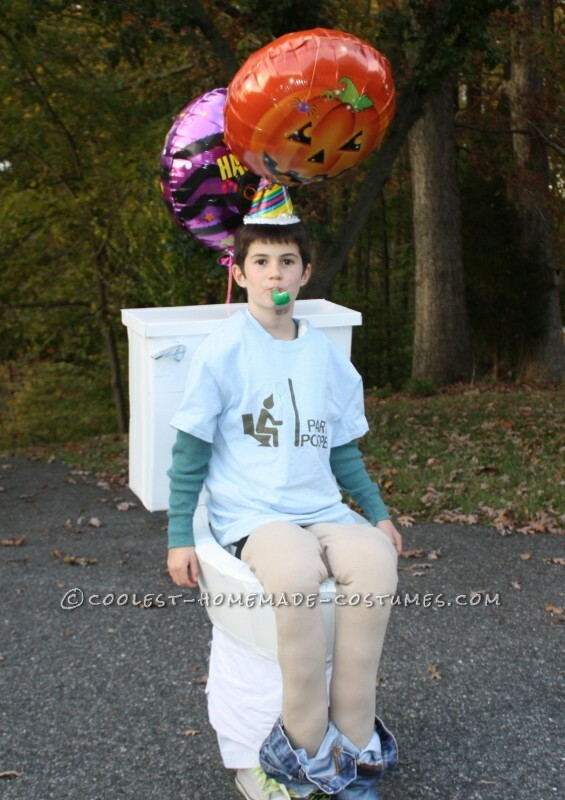 The idea came to me when we saw someone dressed as a plain toilet two Halloween’s ago. Then last year I suggested it to my son, age 7 at the time, and he was way too embarrassed to even consider a costume like that, so we dropped it. 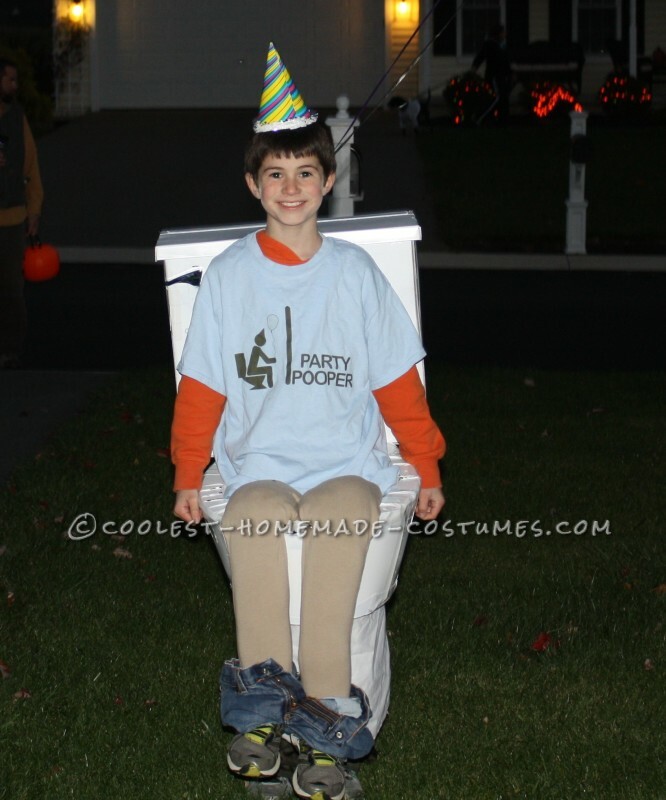 This year, starting sometime in September, he announced that he wanted to be a Party Pooper for Halloween. 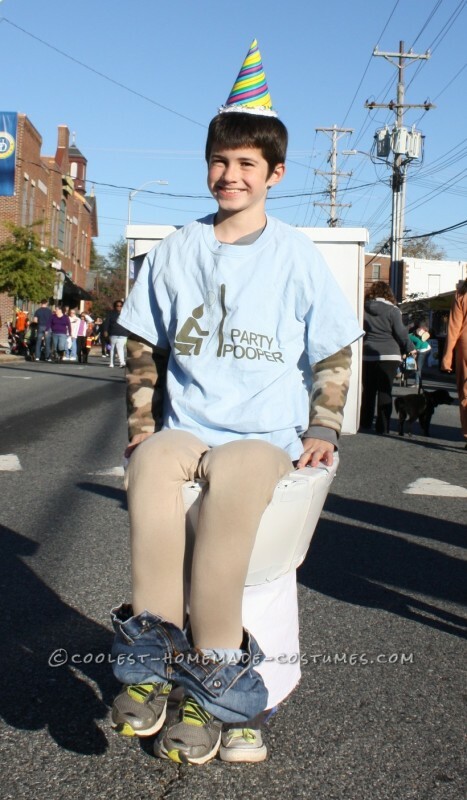 He is a typical 8 year old boy, with a great sense of humor, especially “Potty Humor!” My husband and Timmy got started on the costume the first weekend of October. It was a great project that kept them busy for hours together in the workshop. The object was to make the toilet to scale and use the lightest materials as possible to make it easy to wear. The toilet seat was constructed first out of plywood, and wrapped in white duct tape. The base of the toilet is wrapped with sheet metal, and connected to another piece of plywood at the bottom. The tank is made mostly from cardboard, with an actual handle that opens the tank when the toilet is flushed! This is where he stored his candy. Then everything was spray painted white. There are padded straps that go over the shoulders to allow full use of his hands. White material was attached to the bottom to cover his actual legs as much as possible, while still making him able to walk. Then we filled tan colored leggings with stuffing, and added some jeans around the ankles, and stapled shoes to the bottom. We topped it off with a Party Hat, some party favors and a a few balloons! Our first night out was Friday, October 24th to the Fall Festival at Leeds Elementary School in Elkton, MD. He drew crowds and was surrounded by his peers who were laughing at him, and he won the costume contest for boys in 3rd-5th grade. His principal joked that he shouldn’t even be allowed to enter, as no one else stood a chance next to him! The real fun came on Sunday, October 26th when we attended the Annual Halloween Parade in Newark, DE. When we first arrived Timmy was hesitant to wear the costume and said he felt very embarrassed. He was acting like a true “Party Pooper” and we told him it wasn’t embarrassing that people were laughing because it really is funny. It didn’t take long to boost his confidence, and the compliments came rolling in. After the parade we walked the streets to trick-or-treat at all of the local shops. We were accompanied by all four of his grandparents, as well as his 5 year old sister, Jammi who was dressed as a dalmatian. This town is located in the middle of the University of Delaware and is filled with college students. The reactions ranged from people bursting out laughing to college girls who glanced over and seemed as though they were too afraid to take a good look, pretending they don’t poop! At least 50 people stopped and asked to take his picture, and he received compliments all day long on it. Many people said it was the best costume they had ever seen, and he was soon soaking up all the attention. The Newark Post, a local newspaper, took a few shots and featured him in the paper. 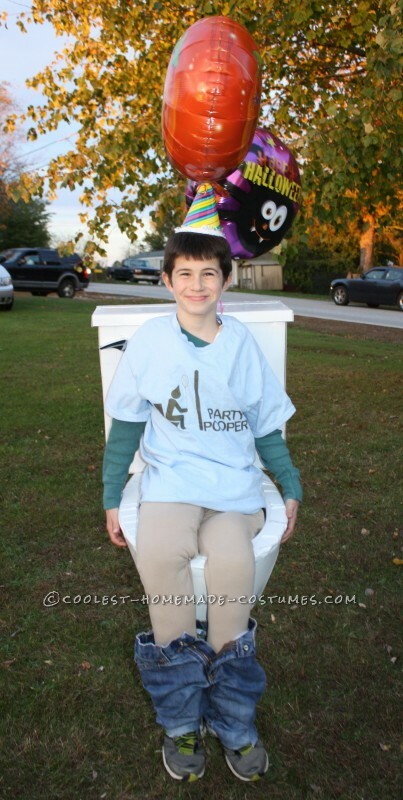 He wanted to carry it on Halloween so he could read the paper while he was on the toilet! It is truly an optical illusion, and several people asked “who else is in there?” or “how can he walk while he is sitting?” We all agreed we could have walked around all day with him because the reactions were priceless! People yelled across the street and gave him ‘thumbs up’ for wearing the coolest costume. We all walked about 10′ behind him and thoroughly enjoyed watching people’s reaction to it. His sister didn’t even seem to mind that he was getting all the attention, as she generally doesn’t like to be in the spotlight like he does. I’m afraid someday she’ll look back and wonder why he always gets the coolest costumes! Last year he was a headless Scientist, and the year before that he was a Robot complete with real lights and gauges, and a wooden claw. He and his father both enjoyed constructing them together and he is learning valuable creative and construction skills. Halloween trick-or-treating was another success. He was totally the center of attention everywhere he went, and nearly every house wanted to take his picture, or call all the other family members over to see him. While you would expect this to affect the amount of candy he received, it was actually quite the opposite! When they saw him flush the handle to put the candy inside the tank, they all kept dumping more. Several times during the night we had to “dump the tank” because it was getting rather heavy on him! He had a blast and really enjoyed seeing everyone’s reactions to him. Great FUN costume. Very creative!